New Delhi, Sep 7 India and the US on Thursday signed a long-negotiated defence pact that enables Indian armed forces to buy more sensitive military equipment from Washington but there was no progress on securing a waiver from American sanctions that bar New Delhi from purchasing Russian weapons or Iranian oil. During their first 2+2 dialogue, the two sides also pledged to cooperate in ensuring “a free and open Indo-Pacific” region to contain China’s allegedly expansionist designs in the South China Sea and Indian Ocean Region. Beijing has consistently denied any such aspirations. Indian External Affairs Minister Sushma Swaraj and Defence Minister Nirmala Sitharaman met their US counterparts Secretary of State Mike Pompeo and Defence Secretary James Mattis for the strategic talks that were first scheduled in April and then in June but postponed on both occasions due to Washington’s preoccupations with North Korea and other priorities. The talks among other key outcomes culminated in the signing of Communications, Compatibility, Security Agreement (COMCASA), originally known as the Communications Interoperability and Security Memorandum of Agreement (CISMOA). The nomenclature was changed to COMCASA to make it India-specific and guarantee New Delhi that the intelligence data shared between the two countries won’t be shared with a third party. Sitharaman and Mattis signed the pact. However, the US appeared to have stuck to its hardline position on barring countries, including India, from doing business with Russia and Iran on which it has imposed sanctions. India has been maintaining that purchase of Iranian crude is crucial to its energy security and that it would go ahead with its purchase of S-400 missile defence system from Russia whose agreement is ready to be signed in the coming months. “With respect to the S-400, no decision has been made. We are working to impose (sanctions) in a way that is appropriate and lawful and to exercise that waiver authority only where it makes sense. And we as a team, the national security team, will work on that, and as we continue to have these conversations with India about that,” said Pompeo. About Iran, he said the Americans had told the Indians “consistently that on November 4 the sanctions will be enforced, and that we will consider waivers where appropriate”. He, however, said the US expected that the purchases of Iranian crude oil would “go to zero from every country, or sanctions will be imposed”. Pompeo said the US was “happy to announce” the inking of COMCASA. Swaraj and Sitharaman said the conclusion of the pact had taken the already close India-US strategic and defence ties to an advanced level. “We are also putting in place an enabling framework for closer cooperation between our defence forces. 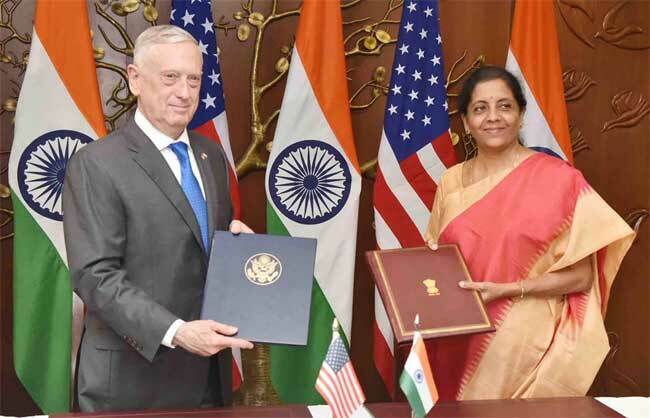 The signing of COMCASA today will enable India to access advanced technologies from the US and enhance India’s defence preparedness,” Sitharaman said. Top defence sources said the agreement, which comes into effect “immediately” and has a lifespan of 10 years, didn’t mean India would have to necessarily buy American military equipment. “India has ensured it gets full access to equipment. There is no commitment on acquisition and there will be no disruption (in case ties soar between the two countries,” a source said, adding the text of the pact was shrouded in “confidentiality”. The previously bought US military equipment — including C-130 Hercules aircraft and the Globemaster C-17 strategic lifters — came without original communications assets. The Hercules is pressed into service to fly commandos in hostile territories where the aircraft has to continuously communicate with them. The US communication system is said to be secure and encrypted. In the absence of COMCASA, India was not given access to it and used its own systems. The pact has also raised concerns about data leakage to third parties. However, the sources said that such concerns have been addressed and there was “enough guarantee” that Indian data won’t be shared with its adversaries. COMCASA is one of the four foundational agreements that a country needs to sign to become a major defence partner of the US, the other three being General Security of Military Information Agreement (GSOMIA), the Logistics Exchange Memorandum of Agreement (LEMoA) and the Basic Exchange and Cooperation Agreement (BECA). India had earlier signed the GSOMIA in 2002, and the LEMoA in 2016, which gives access to both countries to designated military facilities on either side for the purpose of refueling and replenishment. The BECA, which facilitates the exchange of geo-spatial data, is yet to be signed. The US has these agreements, usually limited to NATO allies, with Japan, South Korea and Australia – the major powers in the Indo-Pacific it is looking up to contain China’s military expansionist aims in the region in India’s backyard, threatening sea trade on the key maritime line. Pompeo told reporters that the US and India shared a commitment to “a safe, secure, prosperous, free and open Indo-Pacific region”.